The staff of Wertheim National Wildlife Refuge (NWR) is excited to report that the nesting pair of bald eagles successfully fledged two eaglets this year. Photo by: John P. Cardone. Shirley, NY - August 8, 2016 - The staff of Wertheim National Wildlife Refuge (NWR) is excited to report that the nesting pair of bald eagles successfully fledged two eaglets this year. The refuge has now re-opened Little Neck Run to canoes and kayaks. Refuge staff wish to thank visitors and boaters for respecting the closure, which helped to reduce disturbance and protect the birds and their nest. Favorable locations to view eagles and other wildlife can be found along the Black Tupelo trail at Indian Landing and at refuge overlooks along the Carmans River, with the use of a spotting scope or binoculars. As always, visitors are reminded to obey closed area boundary signs and to adhere to refuge regulations. Bald eagles reach sexual maturity at five years of age, when they also obtain the characteristic white head and tail. They build large nests in tall trees and prefer undisturbed areas along the shorelines of rivers, marshes and large lakes. In the northern United States, eagles generally initiate nest building in December - January. Egg laying and incubation (33-35 days) can start in February and chick hatching and rearing takes place in March – May. Eaglets make their first unsteady flights 10-12 weeks after hatching and begin fledging in June – August. 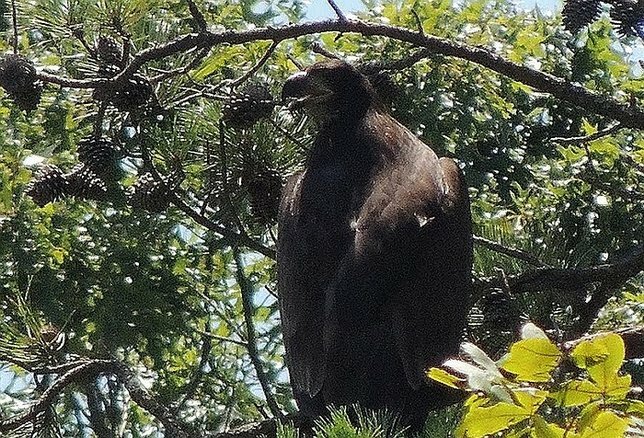 Juvenile (immature) bald eagles are very large bodied and mostly brown overall with white mottling under the wings. Bald eagles were removed from the endangered species list in 2007, but remain federally protected under the Migratory Bird Treaty Act and the Bald and Golden Eagle Protection Act. These acts help to ensure the safety of eagles and their parts (feathers, nests and eggs) from hunting, collection, harassment and other harmful actions. protection of federally threatened and endangered species, the conservation of native flora and fauna, and the provision of wildlife-dependent public uses. For further information, please contact the refuge at 631-286-0485 or visit here. The Visitor Center is open Monday through Saturday 8:00 a.m. - 4:00 p.m., unless otherwise noted closure for federal holidays or management purposes. The mission of the U. S. Fish and Wildlife Service is working with others to conserve, protect and enhance fish, wildlife, plants and their habitats for the continuing benefit of the American people. We are both a leader and trusted partner in fish and wildlife conservation, known for our scientific excellence, stewardship of lands and natural resources, dedicated professionals and commitment to public service. For more information on our work and the people who make it happen, visit www.fws.gov. Subject: LongIsland.com - Your Name sent you Article details of "Wertheim National Wildlife Refuge Opens Little Neck Run After Bald Eagle Nesting"